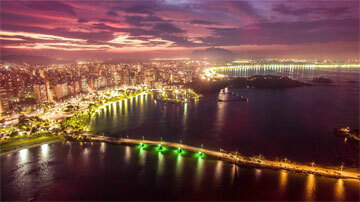 Who ever is present at the International Marble and Granite Fair – Vitoria Stone Fair / Marmomac Latin America, will enjoy the beauties of the capital of Espirito Santo State, one of the three Brazilian capitals located on islands and, therefore, with beautiful landscapes of beaches, bays and canals. During the period that the event is presented the city goes through one of the best moments of the year, the summer hype, welcoming tourist from diverse states and countries. With an area of 104.3km², Vitória is an archipelago formed by 34 islands and a continental region, with some of the most beautiful littoral scenes of the country and with a predominantly humid tropical climate, with an average high temperature 76 ºF and a minimum of 62 ºF. Besides its natural attributes, Vitória offers it’s visitors all the necessary infrastructure for an unforgettable accommodation, with restaurants for all different tastes, where you can enjoy the simple regional traditional plates such as the "moqueca" and "torta capixaba", or you can also find the most sophisticated plates of the International kitchen. For those who like the night life, the city also offers various leisure centers, as well as clubs, bars and restaurants where you can enjoy the regional music of the State such as congo. Being four hundred years old, the state capital (Vitoria) also has a large amount of history from the Brazilian colonial time such as museums, churches and convents preserved in their original characteristics. In Vitoria it is possible to make fast strolls to other small cities like Guarapari, known as “Healthy City", or you still go up the mountains, where tourists may enjoy a cool climate in a colonized region by Italians and Germans. Besides being a tourist city, Vitória is a land of opportunities and business and integrate with the cities in Serra, Cariacica, Viana, Vila Velha, Fundão and Guarapari, a metropolitan region of Grande Vitoria area, the main industrial area of the state, where 32 of the 52 biggest companies of this sector are established concentrating around 27.2% GDP, 29.6% of potential consumption (ICP) and 28.6% workforce in Espírito Santo. This economic dynamism of the capital results, mainly, of foreign commerce services, the support to the industrial urban economic of Vitoria area and the growth of tourism sector. One adds that, in the last years, the activities to the oil exploration and natural gas had gained impulse and already reflects direct and indirect positive impacts in all the metropolitan region, such as: increase of investments and generation of jobs, expansion of the port activities, foments to the business-oriented tourism among others. As one of the cities with highest development rate in the country, Vitoria is ready to enchant it’s visitors in the largest dimensional stone event of Brazil, offering quality hotel and entertainment services, simple transportation to get around, beyond its beauty attributes, and its people hospitality.